Energy access remains a huge problem for most people living on the African continent. More than 600 million out of a population of about 1.3 billion people in sub-Saharan Africa don’t have reliable electricity access. Although sub-Saharan Africa has about 13% of the world’s population, about 48% are without energy access. Only seven countries in the sub-region – Cameroon, Côte d’Ivoire, Gabon, Ghana, Namibia, Senegal and South Africa – can boast of 50% access rates. And, with the exception of South Africa, the energy consumption rate is 150 kilowatt per capita, way below emerging market estimates. It’s been projected that sub-Saharan Africa will require approximately 1,600 terawatt-hours of electricity by 2040. This estimate is four times more than 2010 usage. It’s based on “a fivefold increase in GDP, a doubling of the population, electricity-access levels reaching more than 70% by 2040, and increased urbanisation”. At current deployment rates it will be 2080 before every African has access to electricity. But that can change if governments make it easier for entrepreneurs to enter the arena. The African region currently gets the bulk of its energy supply from fossil-fueled power generation (60%). Other sources include hydroelectric dams (32%) and bio-fuel (7%). Wind, solar and geothermal sources constitute approximately 1% of the energy mix . Increasing pressure on the grid has seen many African countries diversify their energy sources. Clean coal, gas-powered thermal plants and off-grid solar solutions are becoming increasingly important. On top of this Africa’s energy potential remains under-exploited. In an era where private investors and public funds are receding entrepreneurship is vital to Africa’s economies. With a swathe of technologies opening up, entrepreneurship poses a big opportunity for African innovators. The energy entrepreneur is well-positioned to take advantage of the opportunities presented by the sector. But where can they realistically get involved? Solar offers one potential area. Projections are that by 2050 solar PV will represent 16% of the total global electricity mix. It’s estimated that small-scale off-grid projects operating in rural areas have the potential to power half the world. Solar PV offers sustainable investment opportunities for entrepreneurs due to advances in solar PV technologies. Entrepreneurs are already beginning to seek out opportunities. The most successful are those with local knowledge who’ve identified appropriate solutions specifically for their communities. One example is Off-Grid Electric in Uganda. It provides low-cost, environmentally-friendly power sources for lighting, cooking and for charging phones. It reaches 50,000 people each month. There’s also M-Kopa Solar in Kenya. It provides for mobile phone charging and a boasts a solar powered radio. 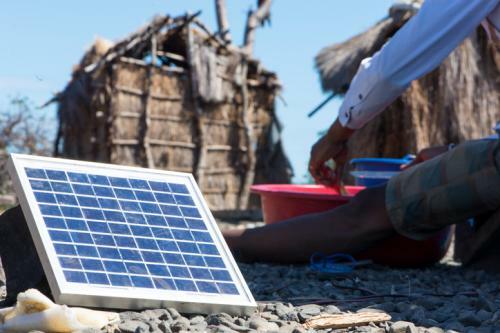 M-KOPA claims 450,000 homes solar instalment in Kenya, Tanzania and Uganda. Shatki Energy is a South African energy startup producing lighting to support 2.3 million off-grid users. One of its main products is the Nuru LED light which when fully charged can produce up to 20 hours of lighting. These success stories shouldn’t overshadow the fact that being an energy entrepreneur is a lot tougher than it seems. Providing energy is generally the government’s job. That alone is enough to dissuade new entrepreneurs. Governments have traditionally subsidised and collaborated with large utilities and grid-based electricity provision. But they haven’t done much for the small-scale off-grid or micro-grid solutions. There are several ways in which governments can help redress this imbalance. One is clear and active about grid extension planning. This would mean off-grid or microgrid entrepreneurs would not be undermined by new extension projects. Keeping small-scale operators in the loop and allowing them a voice is crucial. Regulatory clarity and opaque policy formulation is also needed. In the right environment, small-scale energy providers can use their agility and on-the-ground knowledge to create successful businesses to meet local demand conditions. But this will require regulatory innovation and new administrative processes. There are also issues with subsidies, levies and duties. Governments must make sure that, at the very least, energy entrepreneurs operate on equal terms with established energy businesses. One simple step, recommended by the World Resources Institute, would be to shift subsidies from specific fuels, like kerosene, to energy services, like lighting provision. They must also ensure there are no disincentives for financiers to invest in small-scale energy start-ups. Another, recommended by Lighting Africa, is to take a close look at import duties on equipment like solar panels. Given developments in the sector many import taxes may no longer be appropriate. And finally governments must make it easier for entrepreneurs to start businesses. For instance, with the exception of Mauritius, no other country in sub-Saharan Africa appears on the World Bank Global Index when it comes to the ease of doing business. I have learnt some valuable lessons from working with the Ghana Climate Innovation Center, a technology hub that’s part of the World Bank Climate Innovation Centres programme. The project aims to help businesses develop and commercialise innovative solutions to climate change. It provides local companies with the knowledge and resources to prototype, develop and market innovative clean technologies in sectors like climate smart agriculture, waste management, water purification and energy efficiency systems. The project is in its early stages and the clients are mainly green entrepreneurs focused on climate related needs. These can be spaces where potential funders meet entrepreneurs, explore their operating space and the validity of their ideas. And entrepreneurs can also get the basic training to run successful commercial enterprises. It’s also crucial to be realistic. Inevitably some energy access projects will fail while others will thrive. But that’s what entrepreneurship is all about. It’s time governments on the continent step up and give Africans the opportunity to help themselves.